I know I'm not the only one who does this - but one of my worst habits is failing to read recipes all the way through before I start cooking. Especially if it's something basic or familiar. Like these scones, for example. I figured, "Hey, they're scones! I'll whip them up before bed, then freeze them overnight, pop them in the oven first thing, and we'll have fresh scones for breakfast tomorrow. Easy peasy!" What I failed to realize, however, is that these scones are no ordinary scones. I should have known better based purely on the fact that they come from Thomas Keller's Bouchon Bakery cookbook. There are multiple steps and chills, and while none of it is difficult, it is time-consuming. Lucky for me, I was able to work these in in-between middle of the night feedings, and it wasn't so bad. And when we woke up Sunday morning, they were ready to be baked and enjoyed! Worth it? Absolutely! The scones themselves were soft and tender, and rose sky-high during baking. The little pockets of honey-cinnamon butter were little bursts of flavor. And as they came out of the oven, the scones were brushed with honey butter for some extra sweetness. There are a few interesting aspects to the recipe as well. 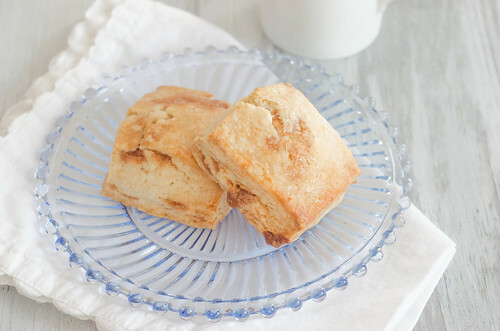 The scones use part all-purpose flour, and part cake flour. This helps them achieve a lightness that would be present in a cake or cupcake, but the sturdiness that you expect from a scone. Typically when I make scones, the butter is cut into the flour, but not fully incorporated, so as to create a light and tender product. In this recipe, the butter is fully incorporated into the dry ingredients. 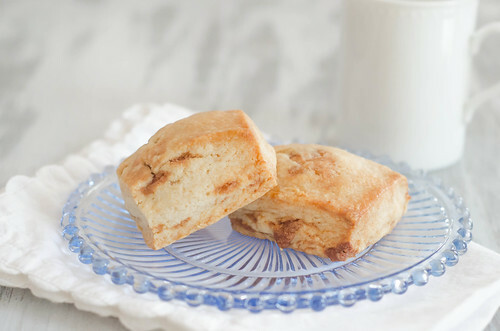 Though because of the multiple chills and the cubes of honey-cinnamon butter, the scones are still light and tender. As for the multiple chills, first the honey-cinnamon butter is frozen, then cut into small cubes. After being incorporated into the scone dough, the dough is shaped into a large rectangle and chilled again. And finally, the scones are cut and frozen solid before baking. All of this results in a uniquely delicious scone. The spice of the cinnamon plays nicely off the sweetness of the cinnamon. These were a nice treat for a Sunday morning. And since I only baked half and froze the other half, they can be a lovely treat any day of the week! The ingredients are given in weight and volume below, but I highly suggest using the weight measurements, as they will produce a superior end result. For the Cinnamon-Honey Cubes: Place the flour in a medium bowl. Sift in the sugar and cinnamon and whisk to comine. Add the butter cubes, and toss to coat. Using your (clean) fingers, break up the butter until no large pieces remain. Mix in the honey using a spatula, mixing until a smooth paste forms. Press the paste into a 4-inch square on a sheet of plastic wrap. Wrap tightly and freeze until solid, at least 2 hours. this can also be prepared and frozen for up to 1 week. 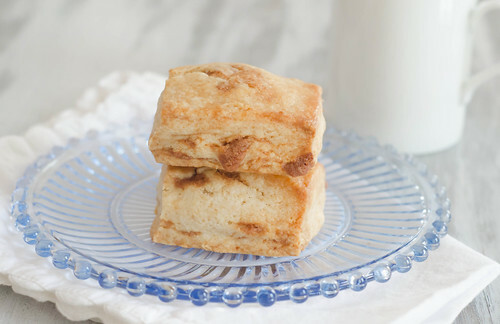 When ready to make the scones, cut the butter paste into 1/4-inch cubes and chill until ready to use. For the Scones: Sift the flours, baking powder, baking soda, and sugar into the bowl of a stand mixer fitted with the paddle attachment. Mix on the lowest setting for about 15-20 seconds to combine. Add the butter and, on the lowest setting, pulse to begin incorporating it into the dry ingredients. Increase the speed to the low and mix for about 3 minutes, or until no large pieces remain. Using a wooden spoon, stir in the honey-cinnamon butter cubes. They may begin to break up a bit, but that's okay. It will give the finished product a marbled look. Dump the dough onto a lightly-floured surface, and mound the dough to form a cohesive dough. Place the dough between 2 pieces of plastic wrap, and using your hands, form it into a 7x10 inch block, smoothing the top and straightening the edges. Transfer to a cookie sheet and refrigerate for 2 hours or freeze for about 30 minutes, or until the dough is firm. Line a baking sheet with a silpat or parchment paper. Using a sharp knife, cut the block of dough lengthwise into thirds and crosswise into quarters, creating 12 square scones. When ready to bake, preheat the oven to 350 degrees for a standard oven, or 325 degrees for a convection oven. Line a sheet pan with parchment paper, and arrange the scones 1-inch apart. Bake 28 to 30 minutes (standard) or 20 to 23 minutes (convection), or until the scones are cooked through and lightly golden-brown on top. As the scones bake, whisk together the honey and melted butter. Brush the tops and sides of the scones with the honey butter as soon as you take them out of the oven. Serve. The scones are best eaten the day they are made, but can be stored in a covered container for 1-2 days. Discovering random "chill for 3 hours" steps in the middle of recipes is the WORST...especially when you wanted the recipe to be DONE three hours ago. But these scones do look so totally worth it! These look sooo freaking delicious! Love this recipe! I'm amazed that you're able to BAKE SCONES while nursing twins! I'm barely managing to just feed myself with only one newborn :) These look fantastic! This recipe is on my list to try as well. Kudos to you for finishing it up while nursing - I'm so exhausted during those nursings that I'd probably mess up the recipe even worse! Made these over the weekend and they are WONDERFUL! I loved them fresh from the oven but also hours later at room temperature. Thanks for a great recipe! These were so good! I think it's time for me to invest in the Bouchon cookbook! I did add 1/2 teaspoon salt, because I found it a little funny that the entire recipe would contain none! Is that intentional? Celine, I definitely noticed it too, and thought it was unusual! Glad you liked them!! We order it quite often, and one day, a few years ago, Caroline reached over and dunked her grilled cheese sandwich in it like it was nothing. See, even at two years old, professional resume editing knew what to do. Ever since then, I pretty much always order the tomato soup and give half of it to her for dunking (and subsequent slurping). To detect high energy neutrinos from the cosmos, one is forced to compensate the extremely Find Anyone at MeSearcher.com small chance that the neutrinos will interact with matter. The only way to do that is to use a very large amount of matter in the detection.